This page will tell you how to resize system partition when Windows Server 2008 reports low disk space warning message on it. Download IM-Magic Partition Resizer Server to increase the size of system partition when it has no free space on Windows 2008. How can you fix the low disk space problem when system partition is running out of disk space on Windows Server 2008? Probably, you still feel frustrated about the system partition low disk space problem, but now you can resolve the problem easily with third-party partition software. IM-Magic Partition Resizer Server works as professional partition manager software to resize hard disk on Windows Server effectively and efficiently. This partition software allows you to extend system partition without reinstalling system or repartitioning the hard disk on Windows Server 2008 and other Windows Servers. "There is only 2GB free space left on system partition in Windows Server 2008, so I want to increase the size of system partition. However, both Disk Management and Diskpart cannot extend the system partition. 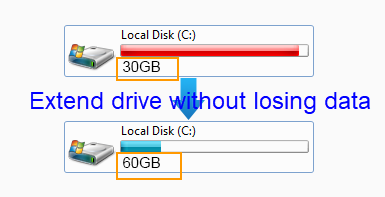 I don't know why but when I run Diskpart, system says that the selected drive cannot be extended. When I open Disk Management, the Extend Volume option is grayed out on system partition. Then, how can I resize system partition on Windows Server 2008?" "I need to resize system partition on Windows Server 2008, but I don't want to reinstall the operating system and repartition the hard disk. Can anybody tell me how can I resize system partition without reinstalling? I am wondering if I can add new disk to extend the system partition space." You can install more than one disk on a PC for data storage, but you cannot add the free space from one disk to another. In another word, you cannot move free space from other disk to extend the system partition. However, you can move free space from other partitions on the same hard disk to increase the size of system partition. Generally speaking, there are three solutions for system partition resizing on Windows Server 2008. As mentioned above, Diskpart command and Disk Management have their limitation when you want to resize system partition. 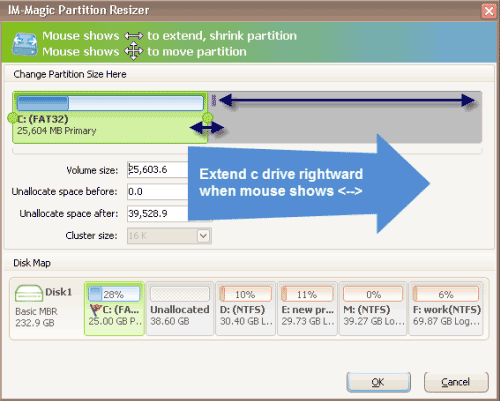 With IM-Magic Partition Resizer Server, you can increase the size of system partition with ease. This partition software allows you to resize system partition without reinstalling system, so it is time-saving. In addition, this partition supports both NTFS and FAT32 file system. You can resize system partition without rebooting your computer or repartitioning the hard disk, so the partition software is safe for data stored on the disk during the partition resizing. With this partition software, you can increase size of system partition on Windows Server 2008, SBS 2008 and Windows Server 2008 R2, etc. If it is RAID 5 runs out of disk space on system partition on Windows Server 2008, you can also rely on IM-Magic Partition Resizer Server. This partition software can work with RAID 5 array to resize disk partition without rebuilding the array. You can move free space from other partitions on the RAID 5 to expand system partition. What is more, you can also add new disk to expand RAID 5 system partition on Windows Server 2008. If you need to resize RAID 5 partition, you should remember not to break the array before resizing the disk.